09.00am pick up from the hotel and we will leave Florence and we’ll take an panoramic drive by the tuscan freeway to Siena with it’s vast cathedral and piazza del campo. Free time for shopping and lunch in the local place and then wewill take you to Rome. 09.00am pick up and then we’ll take the highway to Rome with stop in Orvieto , photo up by the cathedral and then we have a lunch in a local trattoria , free time for shopping and then we will take you to Rome. 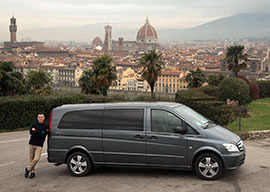 09.00am pick up in Venice and transfer to Florence, by the way we will let you see Verona , famouse for the tortellini “pasta” and the Giulietta’s balcony , finally drop off in Florence. 09.00am pick up in Milano , first stop will be in Ferrari factory , the ferrari test drive is always available .. stop for lunch in a local place and finally drop off in Florence.